My dream is not a colourful dream. Everything is in black and white with occasional grey shades. 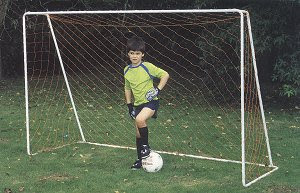 In my dream I find myself sitting inside the goal-post of a soccer field. I sit there for a long time till a ball from no where finds its way from the stands and hits my head. I fallback inside the goalpost and the next moment, I find myself running the length and breadth of the field for the next fortyfive minutes. Then I take my position inside the goalpost till a ball bangs my head again.. I am experiencing this dream for the past three weeks... Guys out there... Do you have any clue what my dream is all about? Are u sure u've been dreaming this for THREE weeks ? Isn't it really after you saw Chak De ? "I was trying to figure out what was speeding towards me and then it hit me"
The only time I had a recurring dream such as that (as in the same action over and over again) is when I am under tremendous stress or am sick. Are you under stress? Hi--here from Diya.There are many sites that interpret dreams..But the best way to do it is yourself--as different things have different symbolism for different people. I dont agree with vigneswarulu--I ALWAYS dream in colour.In fact, some of my paintings (yes I paint ) are images from my dreams. To be it seems like a message that your sunconscious mind is giving you--asking you to be alert about something in your life.Maybe you are deperately chasing something and its eluding you? ur dream shows something related to what u was thinking just before sleeping or something thats bothering u since evening till bed time.. and its recurring as u might be undergoing same treatment since few days.. or something which is running in ur unconscious brain which suddenly become strong when ur own thinking system goes weak while sleeping.. well some part of this theory is my own assumption.. and in depth knowledge is needed to have a clear picture evolving out of this complex system...so its debatable..
oops.. in depth knowledge in "human psychology and dream behavior"
Dream is a wonderful thing which has no colors to it. i saw chakde two days back and I stopped having the dreams. Now my dream is of me inside a hockey field. banana boy of brazil or sleek steak from portugal? you speak like my ethics professor. how many days.. oops .. nights?